Inland Waterways Vessels Market size was valued at over USD 1,600 billion in 2017 and is estimated to exhibit 4.8% CAGR from 2018 to 2024. Growing trading activities in various industries across the globe is boosting the global inland waterways vessels market size. The increasing preference towards inland waterways vessels can be credited to the benefits offered including congestion free and reliable transportation. The advantages offered by the ships including lower emissions, better loading capacity, economical transportation for cargo, and optimum fuel usage in comparison with trucks and railcars will escalate the industry demand over the study timeframe. Continuous government support for upgradation and modernization of port facilities is providing a positive outlook for the industry growth. For instance, in March 2018, Government of India awarded the port sector of the country USD 10 billion for the upgradation and maintenance of the ports facilities for enhancing the inland waterways vessels business across the country. The stringent standards for making the ships reliable and technically fit for operation in waterways are playing a major role in boosting the customer confidence, thereby increasing the global inland waterways vessels revenue generation till 2024. For instance, The European Directives and Investigation of Ships on the Rhine (ROSR) regulates and lays down several guidelines for certifying the ships sail-worthy. These include mandatory certificates for transportation of goods and customers after undergoing stringent inspections, thereby positively influencing the business share. The incorporation of latest technology into the ships enhances the ship performance and safety significantly and focuses on minimizing the operating costs. The introduction of sensors in ships continuously monitors the performance and provide instant information in terms of any errors or damages, easing the travel experience. The advanced navigation systems, GPRS facilities, and GPS or GLONASS technology in the ships enable efficient and fast travel of ships, making them ideal for major companies involved in the export and import of goods, expanding the global inland waterways vessels market share till 2024. High costs associated with the acquisition and maintenance of ships may hamper the industry growth over the projected timeframe. The stringent regulations, climatic conditions, and higher delivery timelines may restrict the global inland waterways vessels market growth till 2024. However, high ROI from the ships will attract increased investments from service providers positively influencing the market share over the projected timeframe. Non-passenger vessels accounted for over 99% volume share in 2017 and is expected to continue its dominance till 2024. This can be attributed to the increasing prominence of workboats including fishing vessels and general cargo ships. The rising transportation of dry cargo and liquid cargo over ships is further supporting the global inland waterways vessels market growth over the forecast timeframe. The increasing usage of tugboats for movement of vessels along with increasing petrochemical shipments will strengthen the segment growth over the projected timeframe. Passenger vessels will grow significantly showcasing approximately 0.5% CAGR from 2018 to 2024. This growth can be attributed to the increasing demand for yachts, ferries, and cruise ships across the globe. Introduction of affordable cruise services and proliferating tourism sector will further expand the market size. Government is taking initiatives for supporting the inland waterways vessels industry growth. For instance, in 2017, Government of China announced several initiatives in partnership with Europe for the development of the Chinese shipyards with latest technology and features, providing stable growth prospects for the global inland waterway’s vessels market size. The heavy fuel oil segment accounted for the highest revenue share of over 70% in 2017. This dominance can be credited to the increased usage of the fuel in multiple vessels. The demand for LNG fuels will grow considerably owing to the focus of service providers to increase operational efficiency of ship fleet. The lower pollution by the usage of such fuel along with lower fuel consumption will positively influence the global inland waterways vessels business share over the forecast timeframe. LSFO will showcase significant growth rate of more than 9.0% over the study timeframe owing to the cleaner nature of the fuel and lower emissions. Rising demand for fuels complying with stringent emission standards will further improve the product proliferation. The easier availability of low-sulfur fuel in bunker ports owing to continuous supply by the oil and gas companies is strengthening the revenue generation over the projected timeframe. Asia Pacific inland waterways vessels market size accounted for over USD 1200 billion in 2017 and is projected to cross over USD 1700 billion in over the study timeframe. This dominance can be attributed to the increasing trading activities and proliferating tourism sector across the region. The presence of vast waterways channel along with continuously rising freight traffic will support the regional dominance till 2024. North America inland waterways vessels market share is anticipated to grow rapidly exceeding 6% CAGR over the study timeframe. This growth can be attributed to the increasing usage of inland water vessels for transporting agricultural products. The increasing shale oil and gas production along with oil exports from Saskatchewan and North Dakota to other states in the region will drive the global market share. 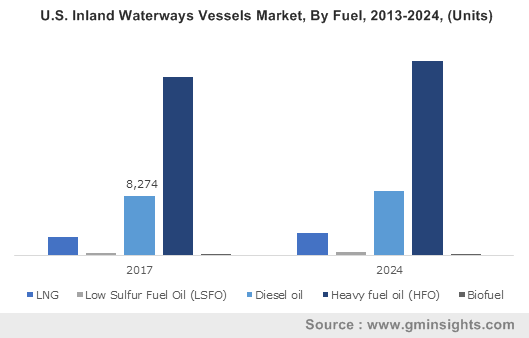 The shipment of bulk freight coupled with insufficient pipeline capacity will provide a positive outlook for the global inland waterways market share. 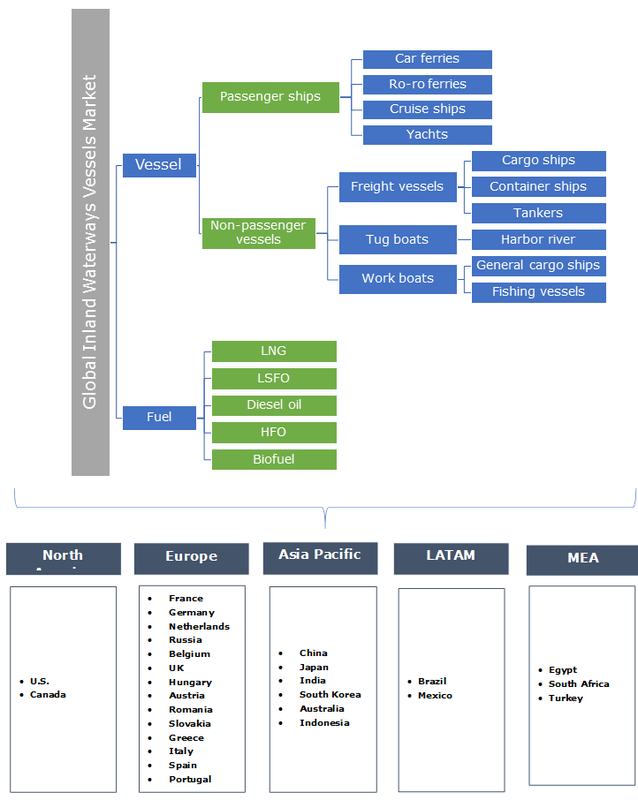 Sanmar, Viking, European Cruise Service, Rhenus Group, CMA CGM Group, Bayliner, and Sneed Shipbuilding are among the prominent players in the inland waterways vessels marketplace. Other notable players include Seacontractors, Windcat Workboats, DFDS, CIWTC, and Norfolk Tug Company. Industry players are focussing on introducing advanced ships with latest technology for diversifying their product portfolio and expanding their market share. For instance, in 2018, Viking in partnership with Fincantieri announced the construction of 16 advanced vessels to be delivered by 2027. Industry participants are adopting mergers and acquisitions strategies for enhancing their market share. For instance, in October 2017, RCS Logistics was acquired by the Rhenus Group for expanding its logistics services portfolio across the globe. Additionally, in 2017, the company acquired 40% stakes in Arkon Shipping company to expand its operations across Europe. These strategies will provide stable growth prospects to the global inland waterways vessels market size till 2024. Industry participants are focussing towards offering efficient mode of transportation for its customers across the globe. The introduction of innovative features including LNG powered ships, GPRS navigation, and solar monitoring systems increase safety of the ships and reduces fuel consumption significantly, supporting the increased adoption of such services till 2024. However, high cost of maintaining and acquiring these ships along with stringent regulations may hamper the market growth over the projected timeframe.